Seven amendments have been tabled so far, but others can be submitted at the last minute. This amendment has cross-party support including from Conservative Dominic Grieve and Labour’s Hilary Benn, who is also chair of the Brexit Committee. 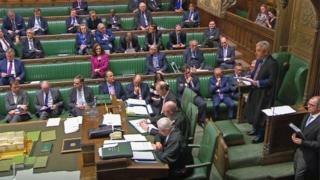 Mr Quince’s amendment has support from DUP Westminster leader Nigel Dodds and members of the European Research Group including Jacob Rees-Mogg. Her amendment has support from Conservatives Oliver Letwin, Caroline Spelman and Nick Boles – as well as from Labour MPs and the Independent Group.